Dr. Aruna Kalra is a Consultant Gynecologist & Obstetrician and practices at Aruna Clinic in South City 2 & CK Birla Hospital for Women in Sector 51, Gurgaon. 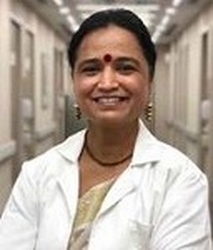 Dr. Aruna Kalra has completed MBBS from Baba Raghavdas Medical College, Gorakhpur in 1996 & MD (Obstetrics & Gynecology) from Kasturba Medical College in 2000 and has expertise In Abortion, Colposcopy, Hysterectomy, Hysteroscopy, Abdominal pain, Women Diseases, Breast Screening, Vaginal discharge, Menopause problems, Rashes and itching, Infertility Treatment, High Risk Pregnancy Care, Heavy or Irregular Periods, Laparoscopic Gynae Surgery, Caesarean Section (C Section), Normal Vaginal Delivery (NVD), PCOD etc. You can book an appointment online with Dr. Aruna Kalra on www.Lazoi.com.